How to make functional mosaic art objects for the garden and home. Ideas and inspiration for beginners and masters. Mosaic advice, hints, do's and dont's. 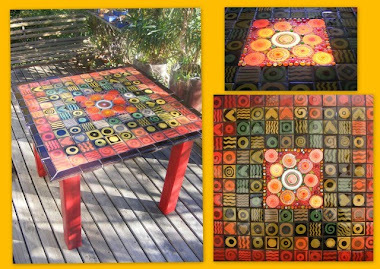 How to make original and long-lasting Mosaic table tops, chair seats, garden pot planters, mosaic framed mirrors and more. This is how I made the leaf mosaic pieces. Press leaves into a smooth slab of clay.- Thickness should be uniform.. Mine was about 6mm thick in this case. I have used wild geranium, nasturtium, bouganvillea and cluster fig leaves. Leave overnight. Do not pick up the pieces or handle them while the clay is soft. The next day, once the clay is past the floppy stage, you can lift them and carefully remove excess 'between bits' for recycling. Use a damp sponge to clean up the edges, leaving the leaf on the surface, to protect the leaf imprint in the clay from being wiped off. Peel off the leaf and gently wipe edges one more time. Now allow them to dry. Not too fast or they will start warping. They are fired 2 x after this, you can apply the colour pigments or underglazes at this stage or at glazing stage, it depends on the effect you want. The lovely "surfboard" shape of the leaf is wonderful to work with- look how they fit snugly together on the board while they dry. So easy to work with and put into position. Sally, my mosaic student, doing a fine job of an umbrella stand for her mother, who is the owner of one of my first leaf table tops. So this umbrella stand will match it nicely. Your items are awesome! I can't believe nobody wanted the owl and hare piece! Loved them all!I wish I had a kiln! I would love to try it out! Thanks Jane. or find a local pottery class where you can make your own inserts. It really is easy to do. Do you sell your leaves???? of course we do! How many do you want? 100? 10? 1000? we can make any number and they come in all sizes and colours. Transport is the pricey and challenging part, but only if you live on the other side of the globe. THANK YOU for web-publishing your process, your pieces and your inspiration -- all on one page (and I bet there are more!) 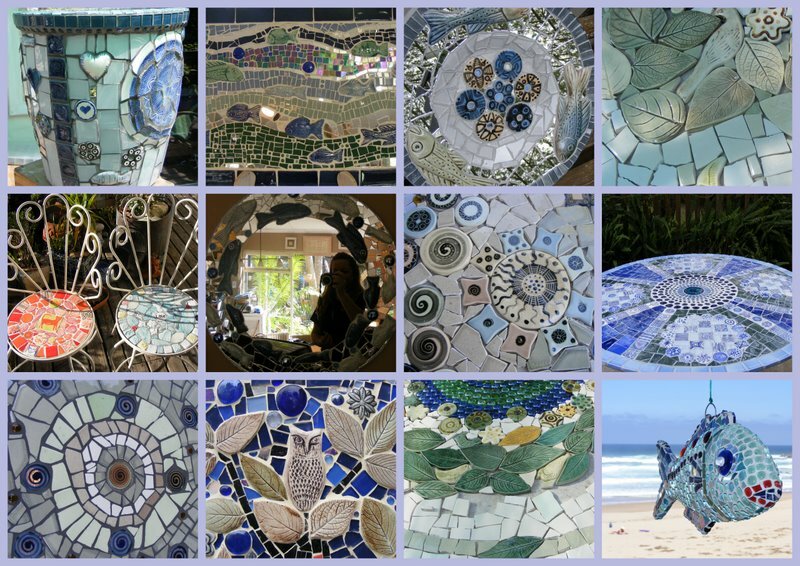 I am really interested in creating mosaics, and have especially wanted to build a table-top, but have not known how. I am SO grateful for artists such as yourself who publish so that people like me can understand, be inspired and actually TRY. You can find me on Facebook "The Knysna Pottery & Dye House". Ruth Renwick the owner- lso has an etsy shop- I must ask her for the details. we can add these leaves or any of the handmade tiles to her etsy shop. She is going back home to the US in July 2016. I am not involved at the pottery house- they are focussing on their own handmadetile designs and lots of big orders, and I have closed down all my mosaic and pottery production, sold my kilns, and some equipment. I still have more tiles and molds to sell if anyone is keen. Truly appreciate the step by step instructions with pics. Thank you so much for sharing your work. I'm currently taking a ceramic class through our local Parks and Recreation so I've been watching a lot of YouTube videos trying to find instructions to try my hand at leaf impressions - you're info is straight to the point. I'll pin this to my page. Thanks again and I'm loving that tables! Thanks Dee. Have fun- I have just made a whole bunch and am off to the pottery house to clean them up. I am starting a nrew mosaic project- a Knysna forest canopy with baboons, our funny Loerie bird and elephants. Once I get it done, will add blog post and pics. what kind of clay are you using and can I use them in my Bathroom Floor, could I walk on them? yes of course you could walk on them. Ceramic tiles on the floor have been used for millenia. It all depends on the temperature that the clay is fired to. High temps are best, but warp more. Brightest colours achieved using low temps though, so it depends on what you are doing. 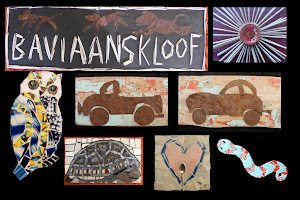 You can make tiles from any kind of clay, earthenware, stoneware or porcelain. Comments are very important, and valued. PLEASE send them to me. these days, I am doing very little mosaic and ceramic work, and am branching out into some new ventures. I still do mosaics and ceramics, but only when I am commissioned to do the work, and I am in the right mood. Outdoor shower mosaic on a curved wall. Welcome to my blog. I hope it provides you with some inspiration to get creative yourself, or to support a local artist nearby. Please follow this blog for more original ideas and mosaic tips. COPYRIGHT. All images and text. Please ask my permission to re use any images or text. Thank you. Awesome Inc. theme. Powered by Blogger.